Today is our family’s Cider Making Day, one of several at our home. Apple harvest in our Western Washington home orchard runs August to October. We have six varieties of apples that ripen at different times. Yesterday hubby Gerry and son David harvested about 60% of our Elstar and 50% of our Liberty apples, and collected apples dropped from the Chehalis and Spartan trees. About 100 pounds of these will go to the local foodbank. We’ll use the rest for cider and storage. The first step in making apple cider at our house is washing off kaolin clay, a natural mineral Gerry sprays on our apples to make them less attractive to apple maggots and coddling moths. Next, we quarter the apples and cut out any bad spots (some maggots and moth larvae still sneak in)—this takes the two of us two to five hours, depending on how much cider we want to make and how much trimming the apples need. 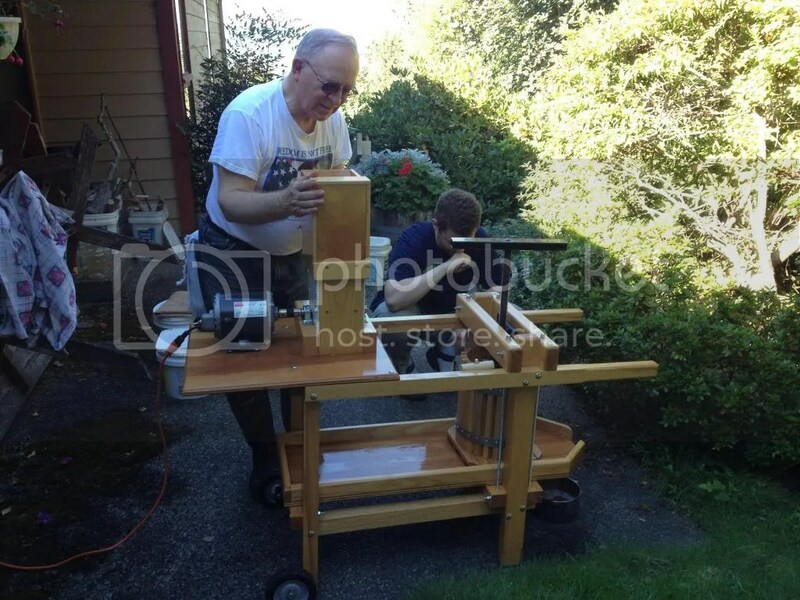 Gerry and David then press the cider outside in a custom-built wooden cider press. The product tastes amazingly like eating a fresh, tree-ripened apple. We’ll have gallons to last us through the coming year. Making apple cider is a measure of the seasons in our house – we’ve been doing it about 15 years, since the trees Gerry planted in 1994 started bearing enough fruit. Over the past 29 months, it’s become a measure of my cancer seasons as well. In September 2011, I had recently finished my first line of treatment (seven weeks of concurrent chemo and radiation). I was tired and weak. Instead of standing at the sink to cut apples, I had to sit on a stool, and I only lasted about an hour or two. I had a recurrence in October 2011. It was a terrible shock. In September 2012, I had recently finished my second line of treatment (five months of chemo followed by six weeks of radiation). I was fatigued, but able to soldier through an entire batch of cider apples while sitting. I had a recurrence in September 2012. It was an unpleasant surprise, but I had a plan, and entered my current clinical trial shortly afterwards. In September 2013, I’m in my third line of treatment (just finished my tenth month on Xalkori). 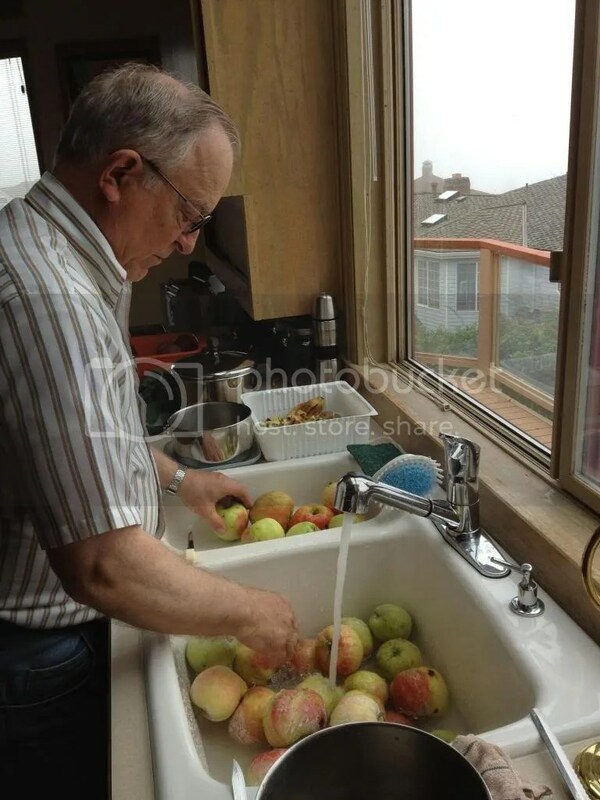 My legs, feet and hands are achy from cumulative neuropathy and edema from treatments past and present, but I have energy and can once again stand at the sink and enjoy cutting apples while discussing matters great and small with my mate for hours. My next scan in is October. If I have another recurrence (and it will happen eventually), I know I’ll either have local treatment of the metastasis, or switch to another trial at University of Colorado. Next year, my family will make apple cider again. Life goes on. This entry was posted in Lung Cancer, The Bright Side and tagged apple cider, Hope, Lung cancer. Bookmark the permalink. Thanks for sharing your annual apple cider ritual. Love the photos. With your positive attitude, I predict you’ll be around to make lots more cider in the future. Thanks for the support, Sandy. Apples…love them, can’t grow them here (we did for a few years, but warming climate means not enough chill hours for even low-chill varieties. Do you have a problem with wasps hovering around your outside cider press? Autumn is the time we have the most assertive wasps. But in past years, before the pear trees gave up (heat, again) I used to make pear juice of them, and the wasps would hang about the kitchen door, trying to get in.